You couldn’t tell to look at it now but the crumbling mansion at 1849 Cass Avenue is one of the most romantic houses ever built in St. Louis. Local cemeteries abound with remarkable funerary art dedicated to lost sweethearts and children but the old Clemens mansion is the only funerary residence that I know of in The Lou. It may not be the most haunted house in St. Louis (the Lemp Mansion retains that title) but it is surely the most haunting. Once you’ve seen the dream house that James Clemens, Jr. built for his wife Eliza six years after her death, you will never forget it. Cast-iron miniatures of Eliza Clemens’ death mask mounted on the lintel of every window on three sides of the mansion assured passers-by that her husband had not forgotten her and all but guaranteed that no one else would either. It was as if the house was perpetually in mourning. Romantic? Very, yet a grim reminder of the risks attached to married life and motherhood in 19th century St. Louis. 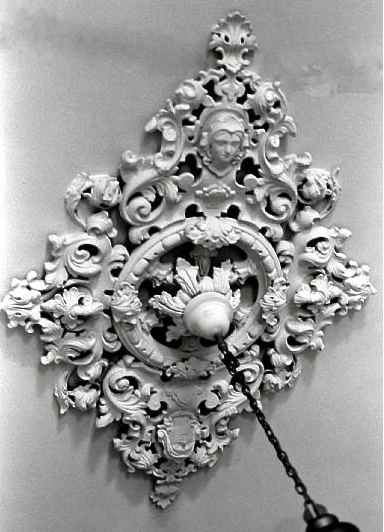 One can only imagine the misgivings of Patrick Walsh, who was commissioned to design the Greek Revival, Palladian Villa with cast-iron, cameo window lintels and Porter White, who was commissioned to reproduce Eliza’s image in the ornamental plaster ceiling molding on the first floor per her grieving husband’s instructions. 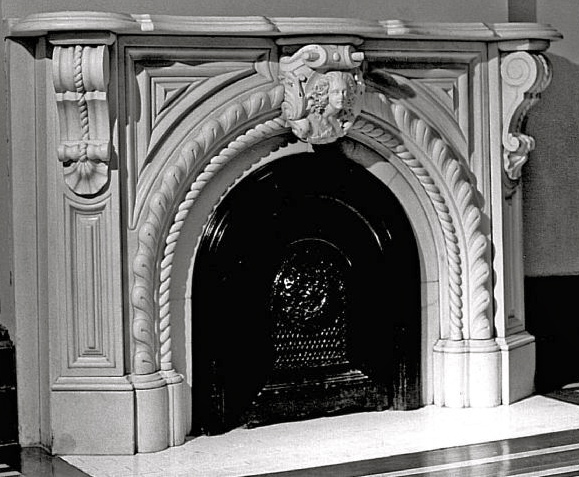 The Carrara marble mantle in the front parlor was to be carved with a rendering of a young, smiling Eliza with flowing curls. The effect might have been quite morbid had Walsh and White been lesser artists. The result was instead astonishing, sobering and mysterious. Neglect and water damage have laid waste to Porter White’s plaster work but other examples of his artistry may be seen in three of the city’s most impressive landmarks: the Old Courthouse, Union Station and the Wainwright Building. Like Patrick Walsh and Eliza Clemens’ parents, Porter White was a native of Ireland and James Clemens’ massive architectural Valentine went up on the northern boundary of an area of St. Louis prairie that would become infamous as The Kerry Patch. 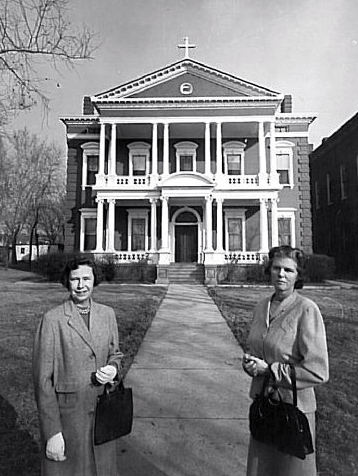 Elinor Matineau Coyle, who featured Clemens House in Old St. Louis Homes 1764 – 1865 and the Stories They Tell, referenced it as “the only house in St. Louis with a built-in ghost”. “A pioneer in the St. Louis Renaissance Movement of the 1950s – 1970s”* Coyle did priceless work researching, photographing and writing about local landmarks that paved the way to the rescue of many, and the cataloging of other lost, architectural treasures. 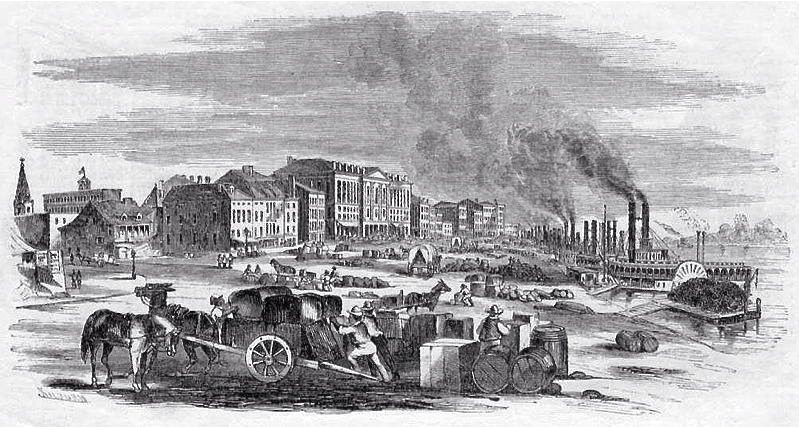 St. Louis’ Great Fire of 1849, in which most of the central business district burned to the ground, convinced James Clemens, Jr. that his home needed to be fireproof. 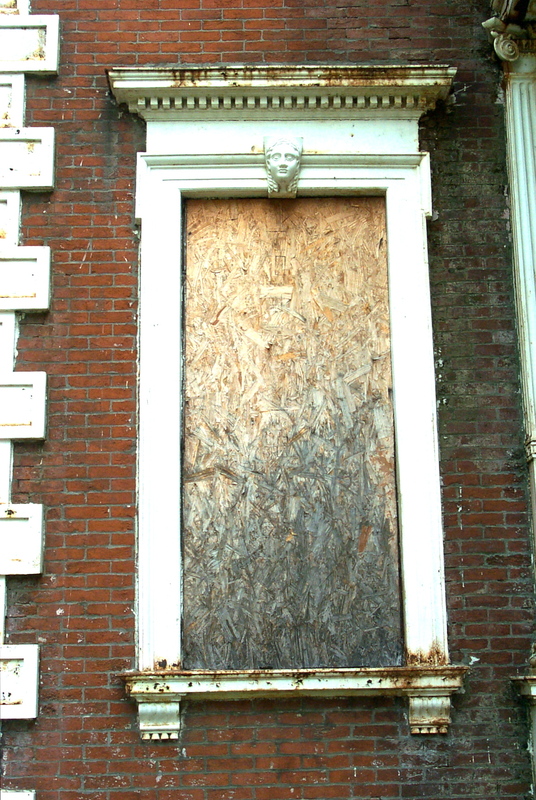 Patrick Walsh succeeded magnificently in meeting his demands with what is said to be the first significant use of cast-iron on a residential building outside of New York: cast-iron columns supporting a cast-iron trimmed portico, cast-iron ballustrades, cornices and the cast-iron miniatures of Eliza’s death mask. How often James’ later-famous, younger cousin, Sam visited the house on Cass Avenue no one now knows. But in his early years in St. Louis, Sam Clemens would have been a frequent visitor to James’ and Eliza’s home on Third Street (where Eliza died in 1853) for it was within two blocks of the boarding house where Sam lived while working here as a printer’s apprentice and the store James owned at Main and Market Streets. According to one Clemens Genealogy, James had given a lot of help to Sam’s struggling family. 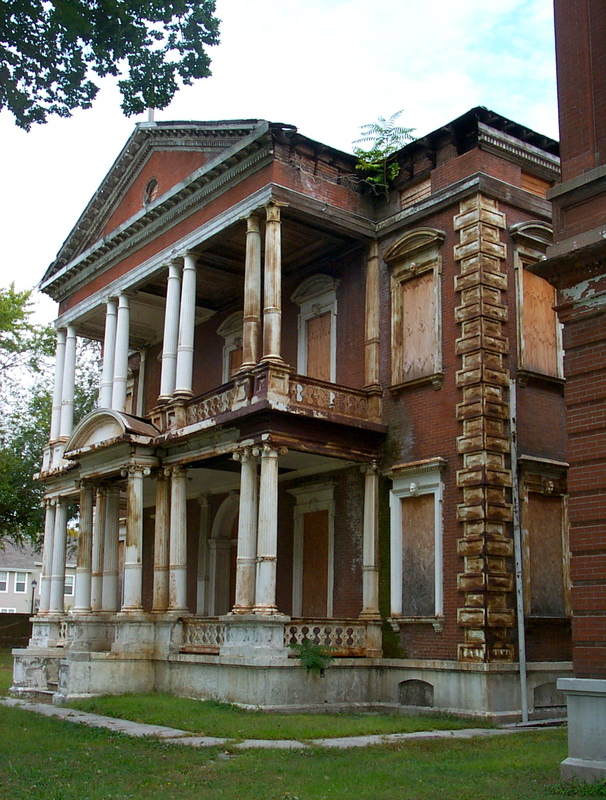 Thanks in great part to the Landmarks Association of St. Louis, photographs of Clemens House when it was still grand, survive: the bricks neatly tuck pointed, the walls sound and its lovely plasterwork and sculptured mantles intact. But by 1960 when these photographs were taken Clemens House had evolved from an elegant residence into a convent, then a mission house; hence the cross then visible atop the portico. When Camille Dry sketched James Clemens’ residence on Cass Avenue for Pictorial St. Louis 1875 (Plate 52, #2) James was still living. There was no exterior cross and the trees that stood on either side of his property ( land Eliza inherited from her father, John Mullanphy, the first millionaire in St. Louis) and a circular carriage drive in front of the mansion were clearly in evidence. During the 1980s Clemens House served as a Catholic Worker homeless shelter. But it has stood empty long since, while one investor or contractor after another attempted to restore and bring it back to life. And little wonder. Many a heart has been captured with one glance at Clemens House. 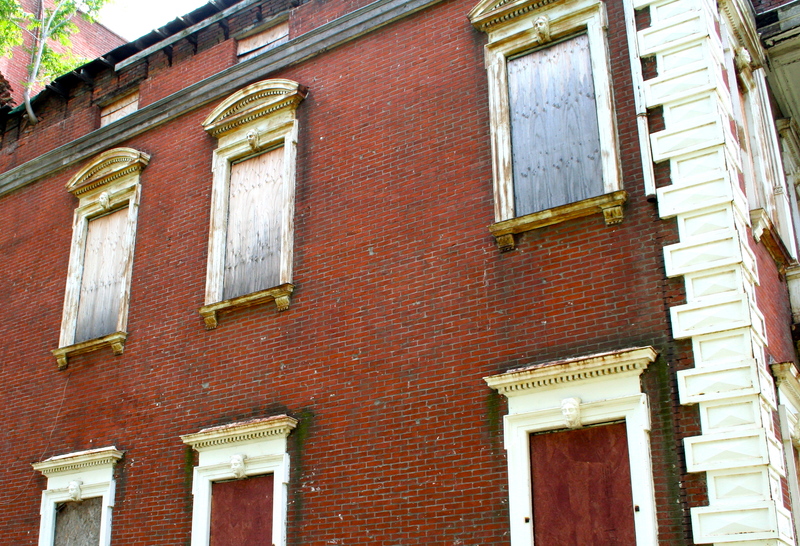 The most recent plans of which I am aware involve its renovation into Senior apartments. 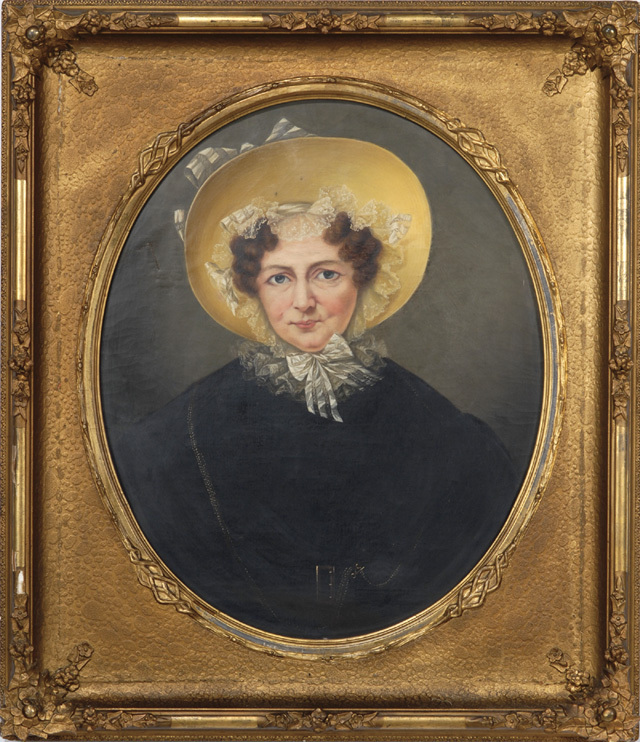 Elizabeth Brown Mullanphy married James Clemens, Jr. on January 10, 1833 when she was twenty-one years of age, in one of the most celebrated weddings of the season – a love match between a highly successful merchant (the wealthiest and most eligible bachelor in St. Louis) and the shyest, gentlest of the Mullanphy girls. They were in some ways polar opposites – James, known for having collected taxes at the point of a gun in Kentucky, where he was raised; Eliza gracious and soft-spoken, having been educated in a convent school in France. He was twice her age. He would outlive Eliza by a quarter of century. Eliza gave birth to twelve children in twenty years, the second and third to last, twin daughters – Alice, who lived to be sixty-two and Frances, whom Eliza lost six months before her own death, as one writer put it, of no apparent reason. There was reason enough. Eliza and James Clemens buried five of their twelve children before the age of three. In all they would lose five. She had a stoic model in her mother, Elizabeth Brown Mullanphy, for whom she was named. A native of County Waterford, Ireland, Elizabeth Brown gave birth to fifteen children, eight of whom survived infancy. 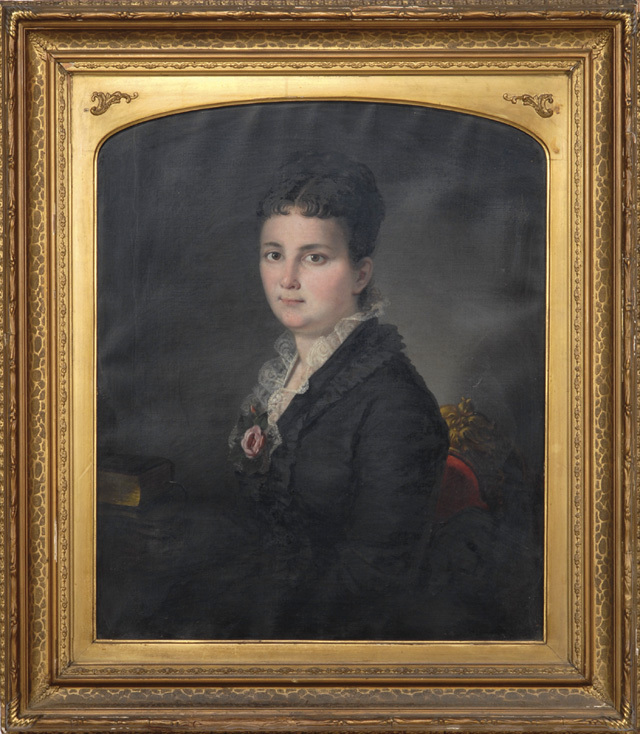 The painting of Elizabeth that sold in March of 2011 at O’Gallerie Fine Arts, Antiques and Estate Auctioneers in Portland, Oregon reveals a petite, determined woman, with the personal resources to get on in the world. She lived to be seventy-three years of age. Eliza was not so fortunate. Beginning in the early 1830s cholera, which has it origins in the Indian sub-continent, spread inside the U.S. from ocean ports and by steamboats traveling up the the Mississippi River. 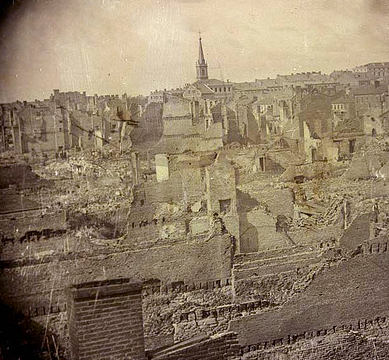 The Great Cholera Epidemic of 1849 was the worst in this city’s history. Over 4,500 St. Louisans died of the highly contagious disease within a six month period of time, approximately one eighth of the population. A third of these were children, who were especially susceptible to cholera which can kill within hours. Pregnant with her twins in 1849 Eliza must have had her hands full, caring for six children. Anyone who has nursed a family through the flu knows how exhausting it can be. And cholera in 1849 was so much worse. Two year old Jeremiah succumbed to it in August of that year. 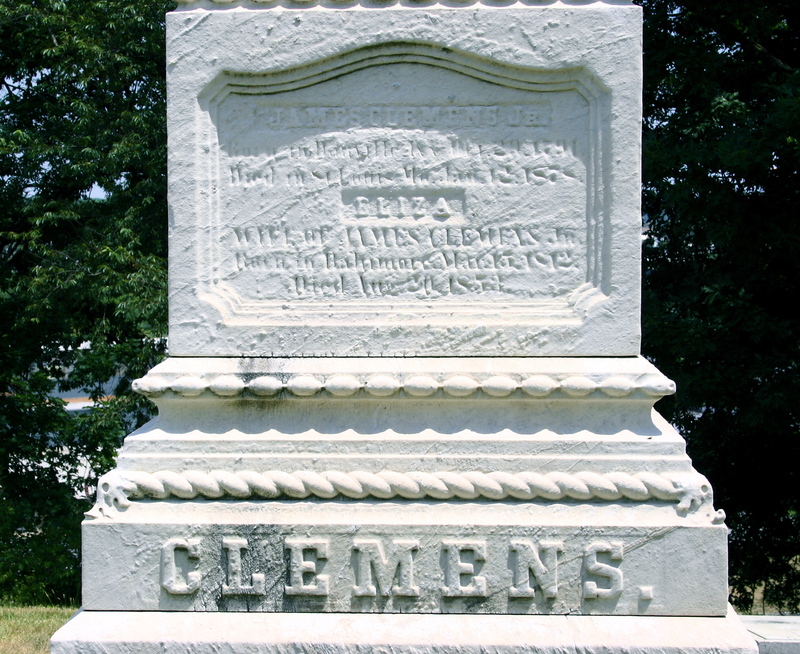 But the Clemens’ had a lot of company in their grief for city streets were clogged with death wagons making their way to overflowing cemeteries. Eliza’s death in 1853 left James a widower with seven children, the youngest nineteen months old. But he never remarried. Instead he commissioned a house where he would be able to see images of Eliza every day of his life. On April 16, 1863 their daughter Catherine (at left) escaped that house and eloped with Joseph Bryan Cates, marrying him at St. Bridget of Erin Catholic Church, over the objections of her father. Catherine smuggled her clothing out of the house, wearing two dresses at a time and leaving them with the Sisters at the Visitation Convent nearby until her wedding. The stories that house could tell if walls could speak! Happily Kate (Catherine Jane) Clemens followed her heart. I’ve been chatting online with Jay Seeley. Catherine’s first child, John Mullanphy Cates was the father of Jay’s Grandmother, Kathleen Cates Tilton and his Great-Aunt, Harriet Cates Hardaway. So the Clemens/Mullanphy line continues to this day. James Clemens, Jr. was as staunchly Protestant as Eliza was Catholic. His was a deathbed conversion to ensure that he could spend eternity with Eliza. 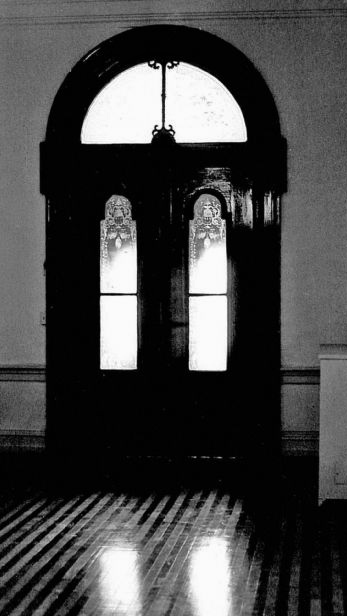 Art glass windows from the private chapel he had designed for the house on Cass Avenue are divided between mortuary chapels in Resurrection Cemetery and Calvary Cemetery, where he and Eliza are buried. Theirs is an elegant monument in the classical style, a stone’s throw from that of the Mullanphys. But the most lasting and poignant memorial to their love valiantly attempts to remain standing at 1849 Cass Avenue until a financier with a small fortune and a sentimental heart can set it to rights. References: City of St. Louis Historic Preservation Website; * Find a Grave: Elinor Martineau Coyle ( http://www.findagrave.com/cgi-bin/fg.cgi?page=gr&GRid=11452 ); Old St. Louis Homes and the Stories They Tell – Elinor Martineau Coyle, Folkstone Press, 1979. Jay Seeley, descendant of James and Eliza Clemens, from whom I hope to learn much more in the future. Cynthia Millar of the St. Louis Public Library who kindly assisted me in accessing passages of Saga of an Irish Immigrant Family: The Descendants of John Mullanphy by Alice Lida Cochran, Arno Press, NY, 1973. Photo Credits: Special thanks to Peter O’Grady of O’Gallerie Fine Arts, Antiques and Estate Auctioneers of Portland, Oregon (http://www.ogallerie.com/auctions/2011-03/) for permission to use images of the paintings of Elizabeth Brown Mullanphy and Catherine Mullanphy (later Cates, then Frost) from the company’s 2011 Catalog, and to Ruth Keenoy of the Landmarks Association of St. Louis (http://landmarks-stl.org/) for permission to use the black and white images of Clemens House captured circa 1960. Victorian Cupid – in the public domain from http://www.karenswhimsey.com; Cholera Bill and The Levee or Landing, St. Louis, Missouri – 1857 illustration from Ballou’s Pictorial Drawing Room Companion, Boston, Massachusetts in the public domain at wikipedia.org. Special thanks also to my husband, Thomas Kavanaugh, for his color photographs of Clemens House, St. Louis, MO and the James Clemens, Jr. monument in Calvary Cemetery. This entry was posted in Hauntings, History, St. Louis and tagged Cass Avenue, Eliza Mullanphy Clemens, James Clemens Jr. House, Pictorial St. Louis 1875, Sam Clemens. Bookmark the permalink. Thank you, Mary. I’m honored that you think so! St. Louis continues to amaze me, as does your knowledge of all its historical nooks and crannies. Thank you so much, John! You are very welcome. I love getting into and trying to sort out those nooks and crannies!St. Louis misses you and Beryl. This is awesome. Thanks for sharing this bit of STL history! Thank you, Danielle! You’re very welcome. I’m so glad you enjoyed the stories. The Clemens Mansion was known as Cass House, when it was a Catholic Worker house somewhere between 1980 and 1990 or so. I lived three blocks away at Karen House, another Catholic Worker house located in the old St. Liborius Convent on Hogan Street. What I remember the most about Cass House now are the floors. It had incredibly beautiful hardwood floors. I probably remember them because I had never seen any like them before. There were patterns made of different colors of wood in them. (These were not just plain old floors!) Ornate patterns, fairly big if I remember correctly. The house was huge. I never was sure exactly of my way around. It seemed like the floors (meaning, first floor, second floor, etc) were unusual -like there were ‘half-floors’ or something like that. You’d go up a few steps and be in one place that didn’t seem to correspond to any other level in any other part of the house. Some of the rooms, i.e. bedrooms off a hallway, were connecting. There was a chapel in the house, which I don’t know if it was original to the house, or had been made into a chapel by the Vincentians (from whom the St. Louis Catholic Worker rented the house for a nominal sum). It seemed like it must have always been a chapel, though, based on the way it looked. I believe the altar area was made with stone, for example, or marble or something like that. The backdrop behind the altar was circular, and Virginia lived behind it in two rooms on either side of it. She was living there as a hermit. Once when I was visiting her I heard Martha playing a flute in the chapel. The sound was so lovely because the acoustics amplified it and made it sound very rich. (Plus she was playing well!) Clare and Joe (members of Karen House) got married in that chapel. I remember being told that the small house in the back by the wall was once a slave quarters. I don’t know if that’s true or not. Cass House had a soup line and also offered hospitality to homeless men. Hence, most of my memories are of the people there. I didn’t pay a whole lot of attention to the actual house. I wish I had! The Catholic Worker passed the house on to a Baptist group who used it for awhile to offer hospitality. They passed it on to some other group, I believe. It is heartbreaking for those of us who used to either live there or visit there to see it in the shape it is now. Dear Ellen, thank you so much for taking the time to share these wonderful recollections of Clemens House when you knew it! It’s really coming alive in my imagination. The flooring must have been beautiful! From what I’ve read a chapel was original to the house, something that Eliza dreamed of having. I’ve never been inside but I’ve always had the sense that it was built with great love. I wonder if there was a sense of that on the inside? Thanks for another wonderful, informative piece!! You never cease to amaze me with your knowledge of our great city!! This is a wonderful article about a fascinating part of St Louis history and architecture that is often unknown and overlooked by many who have lived in St. Louis their entire lives. Thank you for your research and for sharing this. Thank you, Jane! You’re very welcome! You are a wonderful Valentine to us history lovers, Maureen. This story is exceptional. Sure I’m blushing, Pat! I’m honored that you enjoyed this historical Valentine. You’re very welcome! As a historian and a native Saint Louisian, with GREAT and PASSIONATE LOVE for my hometown and its History (as well as sorrow for Saint Louis’s penchant for ignoring/abusing/neglecting/demolishing its own rich History) I send sincere kudos for this wonderful article and hopes for a “resurrection” of the “Home that Love, and Grief, Built”. Thank you very much! We seem to have a lot in common. I know. It’s very sad. I grew up on Cass..My brothers and i built a clubhose in this very building..Thanks for the trip down memory land…Special building..please someone restore. Really, Ralph? I would love to hear more about your club house and what you remember of Clemens House – what it looked and felt like to you and your brothers! When would this have been?? While it is a lovely piece, you have one item incorrect – James did not build the house for his wife. 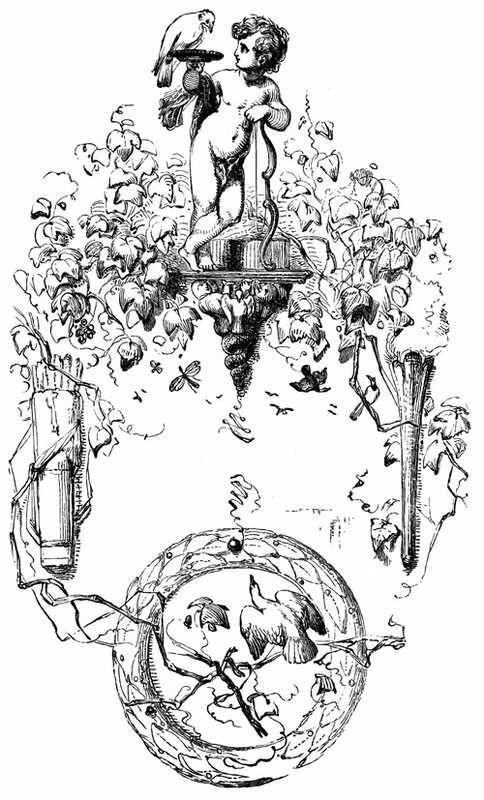 He built it for his duaghters, Helen and Cathern and Alice, as stated in one of his numerous letters to Helen. Wow! Thank you, Mery! I have never seen any of James Clemens’ letters to Helen and I would love to! Thank you again, I stand corrected. Where are the letters? Feb 22, 2014. Is the house still standing? I just visisted recently! My Great Aunt was a nun that lived there in the 1950’s. She was a teacher when it was a convent and school. I have pictures of her standting on the porch and in the yard by the trees. She later moved to an abbey south of the city, and she is now buried at Resurection. If I had some $$ laying around, I would love to restore it and turn it into a Bed and Breakfast! I am doubtful the chapel can be saved, but the home should be able to be saved! Thank you so much for sharing this, Jenny! I wish the Clemens family descendants the very best in this endeavor. What an amazing tribute to Eliza Clemens this structure was! A terrible loss to St. Louis history.